For the dates and booking information for Public Open Days in the first half of 2019, visit TicketSource. Subscribe to be notified of future open days and events. At present the grotto can only be visited by members of the public during monthly openings, the Twickenham Festival in June and Open House London in September each year or by special arrangement (see below). Dates and booking procedures for visits during the Festival are advertised locally in May and on this page. 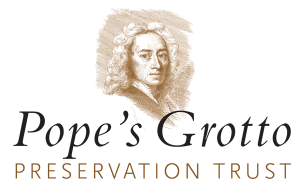 Individual visits can be arranged in exceptional circumstances for accredited scholars and specialist historians. It may also be possible to arrange visits for other groups (up to 25). As the grotto is in Radnor House School, visits are not normally possible during the school’s opening hours. Therefore, visits will usually be after school hours, at weekends or in school holidays. In all cases, visits are subject to the School’s permission and cannot be guaranteed to meet your requirements. Enquiries about arrangements for private visits should be made by contacting us here. Please note that a donation to the Trust will be requested. The Grotto is owned by Radnor House School. A map of the School’s location can be found here. The Trust and Radnor House School are looking for volunteers to assist on public open days and other events. This year, we will have been open for 12 days, but when conservation of the Grotto is complete, we will be open to the public for 30 days a year and a larger pool of people will be needed. If you are interested, please see our Volunteering and Jobs page. No special skills or knowledge are required.